In this day and age, modernising your home is a trend that we hear all of the time from our customers. Modernising Your Home, Why Do It? Why do people want to modernise their home? What is so appealing about it? As time moves on, people earn more money and technology advances, a lot of people want the best of the best – which is understandable! Old homes are stunning, with all of their original architecture and rustic appearance, they’re truly a sight to behold. Although people have different tastes, there are millions of people who would do anything to get their hands on a big Victorian manor house. But others are on the hunt for the most up to date, modernised property that they can find on the market. Often influenced by the rich and famous and their out of this world properties, home buyers are on the hunt and wish to replicate this modernisation in their own home. Modern homes can be just as stunning as traditional homes, it gives a sense of the future, and you feel very proud of your spick and span, contemporary home. So if you are one of those who are on the hunt for an up to date home, we are here to tell you that you don’t need to move home! If its modernisation that you’re after, then with the correct decoration you can update your home without needing to move. Which is why we have devised these top tips on how you can modernise your home, so keep reading! When your home is cluttered and has possessions scattered all over the place, it can be hard to present it as tidy. 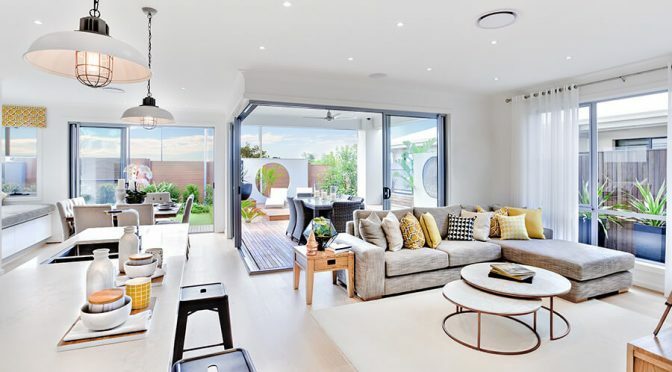 Most modern homes are light and airy with vast amounts of space. If your home is clogged up with old furniture and random gadgets and gizmos, then it’s time to either donate them or throw them out. You have to be strong, hoarding is a common issue that is both normal and severe, but it can be difficult to get rid of things that you’ve had for years. But if it’s modernisation that you want to achieve, then this is the case. For bedrooms, we recommend installing fitted wardrobes in order to optimise storage and to hide all of your clutter and clothes away while maximising space. If you cannot remember the last time that your decorated your home, then this is a clear sign that your home design needs a revamp. To achieve a modern look, sometimes all you need is a clean and paint job, especially in a new build home. New build homes typically have a modern aura about them, simply because of the way they are constructed and the materials used. A simple clean and paint can make your home look brand new. Do not leave out any homes in your house; it’s important that they all receive a deep clean and a paint job or wallpapering to ensure that the design of your home all coincides. If you decide on wallpapering, we recommend I Want Wallpaper for a wide range of stunning wallpaper designs for all households. Take a look here for advice on how you can deep clean your home. If you are someone who likes to keep up with trends and news within home design, then you will know that a popular trend for modern homes are loft conversions. This also applies for commercial buildings, innovative businesses that are taking a modern approach often convert a loft or studio to start their business, and use it as their main office. Not only can a loft make your home appear more modern, it increases your living space and eliminates the need for moving home. Which is perfect if you love where you are, but want to keep your home up to date with the latest trends. Loft conversions Milton Keynes have so many design options, such as VELUX windows which help create a modern, airy environment. Quite often, when you look at modern home designs and places such as modernised showrooms, the lighting is usually crystal clear, and white. It’s typically LED lighting, which will save you on your energy bills, as well as improve the visibility in your home. If you’re looking for LED bulbs, we recommend using Beam LED, who provide a variety of LED bulbs in a variety of shapes, sizes and colours for different lighting fixtures. The reason that bright, clear lighting is associated with modern design, is because it presents things in a clearer light, the white light makes it appear as though everything is much cleaner and spaced out than it is. When you use dingy, yellow-hued lighting, it can make the room appear smaller and can bring on fatigue of those who are in the environment. As we just previously mentioned, lighting has a huge impact on how your property looks. Although you might bypass window replacements, they can alter the lighting let into your home and make things appear bigger. Natural light is great, and you should allow as much of it into your home as you can. We often install VELUX skylights for our clients, or a customer favourite is their balcony windows that open up like a balcony and let you have panoramic views of our surroundings. These are perfect for letting in natural light and do not take up any valuable space. If you are living in an older home, but you’re attempting to make it appear more up to date, window replacement can help your property feel more modern both internally and externally. Often dated homes are fitted with wooden, single paned windows. If you replace these with modernised double-glazed windows, this can create a more modernised appearance. By using these top tips, you can create a modern property, without the hassle of moving house, or finding a new build home. For more information on loft conversions Harpenden, or anything else, then please feel free to contact a member of our staff today.